I am back with another skincare product from Switzerland! Seems like Switzerland specializes in producing various skincare products that is well received all over the world from European to Asian countries. What makes this country in particular to be world's leading country in producing dermatological products? It's their beautiful and nature filled country that plays a big role in contributing to the best ingredients used in their products. Previously i blogged about SkinSoul skincare which one of it's main ingredients also originated from Switzerland, shows how popular and rich this country is with nature. Though this blogpost has been long overdue, because i had to put off reviewing skincare products as my skin condition is worsening. More acnes started appearing and tons of headless bumps can be found mostly at the sideburn area till my jaw and chin area. Definitely need my detox session badly now as those signs are usually symptoms of having too much toxin in one's body. Guess it's better for them to invest in researches to improve their products rather than to sped on fancy packaging. Well if we can have both, why not right? That classic antiseptic cream head lol. This is also the first time i've seen a skincare product in a tube form that can be easily mistaken as antiseptic creams lol best keep this away from the medicine cupboard as this is for your face, not wounds ya LOL. First and foremost upon receiving this product i was as usual skeptical to use it directly on my face as i need to know it's origins, ingredients, etc which was easily answered with their clear packaging. It has all the important information printed on the box making it consumer friendly especially when it comes to product comparison during a purchase. Now what is EXACTLY the function of this product? 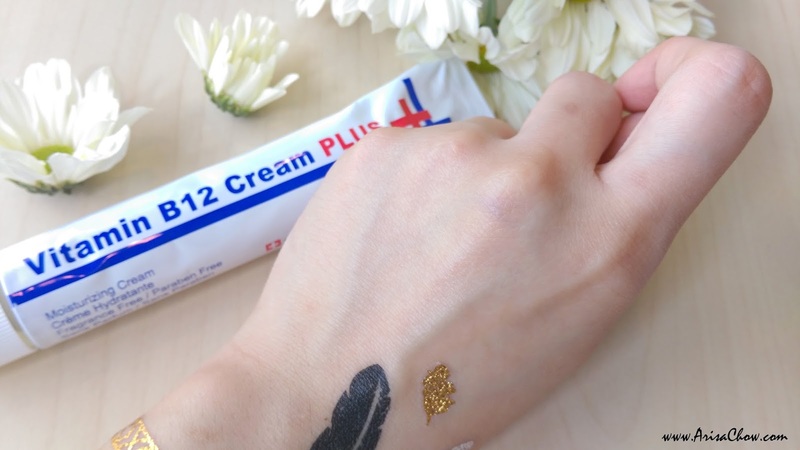 Vitamin B12 cream PLUS+ is actually a moisturizer with functions of obviously hydrating your skin and at the same time has anti-ageing properties to lessen wrinkles and fine lines. This also happens to be a newer and improved version of their previous formula. Like how ALL skin products should be, it is 100% fragrance free, paraben-free and non-comedogenic. Lol, for those not familiar with the scientific term of comedogenic, it basically means it doesn't clog pores, so you don't have to worry about it's rich texture giving your more blackheads or pimples. Honestly i haven't heard of this brand at all in my entire life nor the company so i did a lil research to find out more about this Swissbel Vitamin B12 Cream PLUS+, it's from an international company called Swissbel Laboratory Dermatology that specializes in creating skincare products for sensitive skin people. It's reputable brand lives strictly with these formulation principles (100% fragrance free, paraben-free and non-comedogenic) making them a recommended brand worldwide. Made using an enriched ingredient Vitamin B12 (Cyanocobalamin) that delivers all the functions above and combined with others like Rosa Centifolia Flower Water which actually soothes sensitive skin like mine and Hyaluronic Acid, Squalane, Salicylic Acid (BHA), Vitamin E, Vitamin C, Vitamin B3, Provitamin B5. Overall my review for this product was a neutral one, true enough using in on my sensitive troubled skin there wasn't any irritation nor did it induce additional pimples that my face already has lol. So true to their word, it's sensitive skin friendly and non-comedogenic. Moisturizing is also a yes but it's cream like texture makes it feel abit heavy & thick but definitely no sticky after feel, just a minimal glossy finishing on your skin, it will take about 2-3 minutes for it to be fully absorbed but after that you will have a mattified finishing on your skin. I have a combination skin condition but yet i do feel that the texture makes my face slightly oilier faster but for those with dry skin might not have this problem. Could be because of it's rich moisturizer texture hence that feeling lol. Though it's recommended for day time use but i prefer to use this type of creams at night so i don't wipe it off and let it actually do it's magic while i sleep. As for the make up base claim, also proven right BUT if you are only staying indoors the whole day under air conditioned room. Your face will stay supple, no powder cracks caused by aircond dryness but if you were to run outside the whole day under the sun sweating and all then this won't make a very good base as your make up melts faster lol. Swissbel Vitamin B12 Cream PLUS+ is apparently a bestseller among Asian women, so before all stocks are gone better grab'em! For more updates on new arrivals or ongoing promotions, follow Dofu Malaysia on their official pages.